A rainforest is a forested biome with high annual rainfall. Tropical rainforests arise due to the Intertropical Convergence Zone, but temperate rainforests also exist. 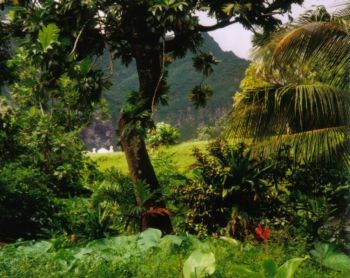 As well as prodigious rainfall, many rainforests are characterized by a high number of resident species and tremendous biodiversity. The largest tropical rainforests exist in the Amazon basin (the Amazon Rainforest), in Nicaragua (Los Guatuzos, Bosawás and Indio-Maiz), in much of equatorial Africa from Cameroon to the Democratic Republic of Congo, in much of southeastern Asia from Myanmar to Indonesia and Papua New Guinea, and in eastern Queensland, Australia. Outside of the tropics, temperate rainforests can be found in British Columbia, southeastern Alaska, western Oregon and Washington, western Caucasus (Ajaria region of Georgia), as well as in parts of the Balkans. While it’s commonly believed that rainforests provide much of the oxygen for the planet, and are the “lungs of the world”, most rainforests do not in fact provide oxygen for the rest of the world. 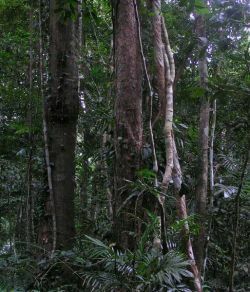 Through the decomposition of dead plant matter, rainforests consume as much oxygen as they produce, except in certain conditions (primarily swamp forests) where the dead plant matter does not decay, but is preserved underground instead (ultimately to form new coal deposits over enough time). Still, rainforests act as major consumers of atmospheric carbon and may play a large role in cooling air that passes through them. As such, many scientists feel that the rainforests are of vital importance within the global climate system.